in the early years of the 21st century ! Reports are becoming more frequent that museum ships in ports all over the world are being threatened, as one by one they face the challenge of major restoration. Many were originally saved in reasonable condition thanks to the foresight of history visionaries in the 1950s to 1970s. But with the passing of time, just like any other structure exposed to the elements, these museum ships have been gradually deteriorating. Eventually a stage is reached when substantial restoration works are required, beyond that of mere chipping and painting and caulking decks. The daunting reality is that each of these vessels will require work akin to that found in a major ship repair undertaking. Naturally this tends to be put off as long as possible, and when eventually the inevitable day arrives that the vessel is in danger of becoming a liability unless something is done, those first tentative enquiries with commercial repair yards reveal potential costs an order of magnitude beyond that which has been budgetted. Somewhat in shock, the owners of the ship are forced to reconsider their position as to whether it is worth going ahead or whether to find a way to dispose of their historic artefact. Such a scenario is not conducive to rational long term decision-making! The intent of this webpage is to provide an insight into an alternative more viable approach to museum ship restoration for organisations that have reached this crucial stage in the history of their preserved vessel. A current project is the restoration of the pilot steamer John Oxley 544 grt. During the course of these restorations, the SHF investigated and tried various approaches before finding a path to successfully achieve its goals. A key element of each of these projects was that the work was done using facilities that were independent of commercial ship repair yards. There are a number of benefits in doing this. The most important benefit was that the project continued to be viable even when funds were low and work had to stop. There were no pressures from a shipyard wanting to release its facilities to carry on commercial work. On more than one instance, work had to be suspended, in which case the ship could be kept (effectively in 'cold storage') until times improved. Other benefits of having restoration independent of commercial facilities were that the Museum could keep better control over the authenticity of the work, volunteer and other community programs could play a major role and so keep down costs, and funds could be raised over a longer period of time as and when potential donors saw progress. Of course, it has its challenges as well including technical responsibility for the outcome, difficulties meeting expectations of progress and exposure to economic cycles of boom and bust. But nobody is saying that it will be easy! 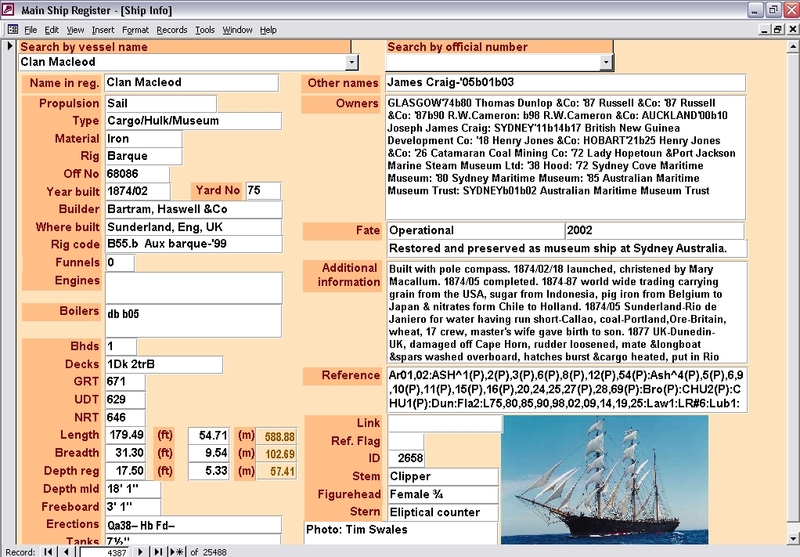 To help illustrate what can be done, click on the James Craig Adventure link (2Mb). You will be able to view a powerpoint presentation showing the James Craig as a wreck, the construction and use of the pontoon dock, and the James Craig under sail after restoration. 1. Something that is not treasured today may well be treasured in the future. 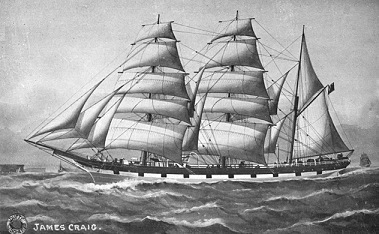 Old sailing ships were a dime-a-dozen in the 1920s and were quite literally thrown away; the James Craig amongst them. Now for us in Australia at least, the generousity and dedication of the many supporters is testament to the fact that the James Craig is highly valued by the community. 2. While a vessel survives reasonably intact, there is hope. 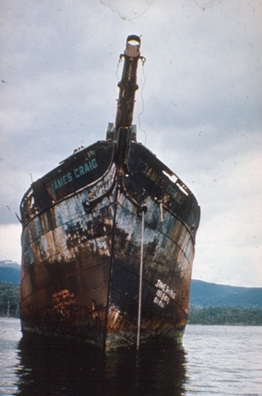 The James Craig lay for 40 years neglected and abandoned. Eventually rescue came, but it would not have had the James Craig been scuttled in deep water or broken up. If the time is not yet right, then a ship needs to be kept in some sort of 'cold storage'. That's part of what Museums do! To identify and preserve historic material well in advance of it's public recognition as a historically significant artefact. 3. An independent facility is vital to improving the likelihood of success. The overheads and time schedules associated with commercial facilities are frequently incompatible with the needs of a major restoration of a historic vessel. This is particularly so for restorations that are subject to a tight budget where all the funds necessary cannot be identified nor sourced up-front. 4. The James Craig restoration benefitted by having a wide rather than narrow vision. Originally, it was intended that she be a static exhibit. However, the more ambitious vision of returning the vessel to a sailing condition helped galvanise public support. It also had a benefit in that the quality of restoration became paramount, short cuts could not be made. A disadvantage was that aspects of authenticity were compromised creating a challenge to find the right balance. The photos show just a small part of the story of the restoration of the James Craig. But, behind the pictures were years of commitment and effort by a very large and diverse group of people. It would also be wrong to say that there were no frustrations, and quite literally, the 28 years that it took to restore the ship saw successive generations of participants. It is the experiences from this adventure that we hope will be passed on to others who are inspired to preserve their maritime heritage by saving ships. A friend of mine, Andy Munns wrote to me with his thoughts on the subject of ship restoration. It also provides some interesting insights. You can read his letter at Andy's page.